What Are the Benefits of Using a Weighted Hula Hoop? Hula hoops have evolved quite a bit since their original popularity in the 1950s. Once considered a toy for children, hula hoops have made their way into the fitness market and are used as props for toning your abdominal muscles and burning calories. Heavy hula hoops, which weigh approximately 3 to 5 pounds and are available in various diameters, can help to maximize muscle growth. 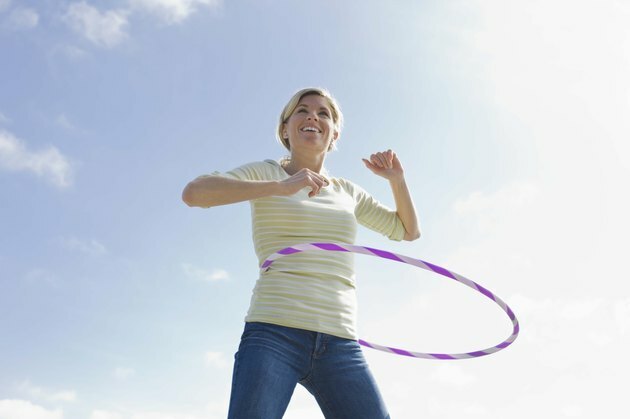 While all hula hoops take some getting used to, once you get the motion down the weighted hula hoop can be easier to twirl for adults. Larger in diameter and heavier in weight than the classic children's version, weighted hoops spin at a slower rate, making it easier to keep around your waist and to use for longer periods of time. If you're tired of crunches and other traditional exercises for the abs, hula hooping may offer you a fun and effective alternative. Spinning the hula hoop around your mid-section requires an active engagement of your hips and abdominal muscles. Additionally, according to the American Council on Exercise, hooping can burn seven calories per minute while providing an effective cardiovascular workout. Consult a physician before working out with a weighted hula hoop. Stop using the hoop and seek medical treatment if you feel any pain in your back or hips. American Council on Exercise: ACE Sponsored Research – Hooping-Effective Workout or Child’s Play? Does Hula Hooping Slim Your Waist?